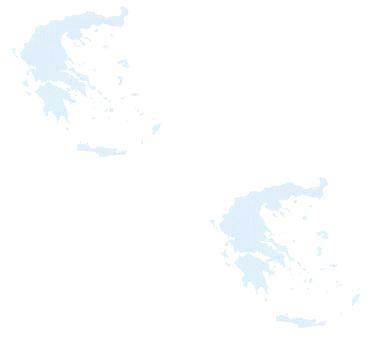 Milos (pronounced Mílos) is found on the South Western part of the Cyclades and has a surface area of 161 square kilometers. Volcanic in origin, the island has two peaks, Prophet Elia at 722 meters and Hontro Vounó, at 523 meters. In contrast with other islands, Mílos has plenty of flora composed of pine and olive trees, fig trees, and in some places, palm trees. Much of the island is rich in mineral deposits composed of different types of metals and iron ores. Mílos has one of the oldest histories of all the cyclades, with the earliest recorded times of around 5000 B.C. Flakopí, the oldest settlement on the island, was in existence at between 4000 and 5000 B.C. The settlement was destroyed twice by invaders and was finally re-built in 800 BC in a different style. The ability to take advantage of the various mineral ores and (zinc, tin etc) gave the inhabitants a plethora of tools having incredible precision for those years. Flakopí's existence is situated between the neolithic and iron ages, as many recent archaeological excavations have found out. At the end, the town was burnt down. The end of Flakopí came at around the same time as the Mycenaen civilisation was flourishing elsewhere. It was around 1000 B.C. and at that time the Dórian invaders arrived on the island. In fact, Thoukidides reported in one of his books that it was for about 700 years that the Dorians made Milos their home. Ove the years, Mílos became a center for artistic endevour as shown by the wonderful statue of Aphrodite of Mílos, created around 400 B.C. and currently on display at the Louvre Museum of Paris. Mílos today is a beautiful island, with excellent beaches, wonderful bays and amazing natural resources, seen as the ship arrives where the color of houses (white) and the earth color(also white - used for Porcelain) create quite an image. This is the port of entry and a south facing seaside resort with absolutely brilliant still waters no matter what the sea is like. Looking at a map, Mílos looks like a pacific island reef! Pláka is the main town on the island. It is built on a rather flat valley with a cycladic arthitecture. On top of the hill, the ruins of a Frankish castle can be examined and a beautiful view is available for those doing the 30 minute climb. Inside the castle the church of Thalasítra is situated which was built in the 13th century. Plaka also has a must-see cemetery (if you can call a cemetery a must-see!). The cemetery looks like a series of catacombes where the rich and poor are buried side by side. In the nearby museum there is an exact copy of the sculpture of Afrodite of Mílos (Venus de Milo) which was sent by the Muesum of Louvre in Paris. Near the town, there are wonderful Roman mosaics (near a place called Tramithiá) and the village Tripití where the real Afrodite lived. In a place called Klíma, there are catacombs dating back to the beginning of the Christian era. On the way to this village, visitors will meet a small settlement called Triovásalo, built by three bothers who returned and built it. Further on, there is the village Péra Triovásalo where in the church of Saint George, a folk mosaic made of colored shells can be seen in front of the entrance. Pollónia, is the second most important town of the island, built on the north eastern part of the island, right on the sea. Nearby can be found the ruins of the ancient town of Flakopí. Going south, for about 5-10 kilometers, one meets Voudiá, a great beach, affected by the Meltemi winds of the late summer. Also nearby are the Glaronisia, four little islands famous for the wonderful caves that are found there. Boats from Pollónia take visitors for thrilling visits. A very nice village, which used to be the ancient capital of the island, until the 18th century. Now, an agricultural center with vines, olive trees and pressing machines and co-ops. In the village can be found the church of Panagiá Portianí built in 1889. The nicest beach of the entire island is found here, while nearby, there are medicinal spas intended for arthritic sufferers. A tour of the island by boat is a must. It will take about 10 hours, a complete day, but well worth it. First we meet the island of Antimílos which contains much rocky outcrops designed for rockclimbers. On it, a special type of goat exists which can be seen jumping from rock to rock. The area is a national park. 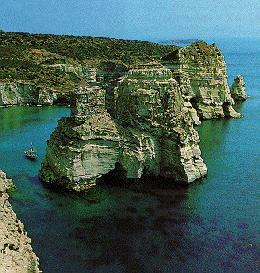 On the west side, we should try and visit the monastery of Saint Paul and further on, we should look out for a rock formation called 'bears' (arkoudes).